A giant depiction of the moon has attracted a record number of visitors to the Harris Museum in Preston. 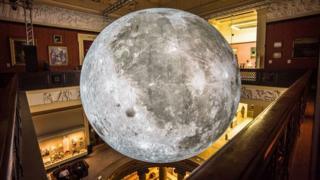 Interest in Luke Jerram's Museum of the Moon, which has a 23ft (7m) diameter, was "unprecedented", the museum said. The huge sphere, based on Nasa photography, has been suspended in the Grade I listed building for a month and will be taken down on Monday. A museum spokeswoman said the model had "brought a whole new audience" to them, with thousands of people viewing it. She said people "standing underneath have been awestruck - the amount of people visiting has been unprecedented." Many visitors shared their experiences of the exhibition on social media. Sarah Regan tweeted: "Saw the moon today, pretty special...absolutely love @HarrisPreston recommend to everyone!" And Colin Anderson posted a picture of a young lad recreating Mercury's pose under the moon. The installation, which was first shown in 2016, is one of several moons by the artist that are touring the world simultaneously.